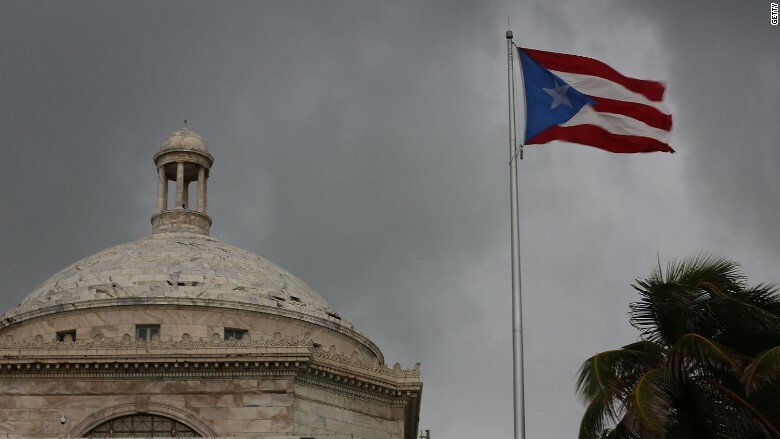 Puerto Rico doesn't have enough money to pay its bills. It went into default for the first time in its history on Monday. Now it's running out of water too. Literally. A drought has forced the island's government to ration water. It's become so bad that the government is actually turning off tap water in people's homes, sometimes for days at a time. The main tourist areas, however, are exempt for now. It's easy to blame this problem on the hot, dry weather, but Puerto Ricans say that isn't the only culprit. They believe the government has mismanaged the island's water supply and pipes for years. Juan Camacho's home will have running water for a day and then no water at all for the following two days. He lives in Trujillo Alto, a town that is a mere 13 miles from downtown San Juan, the capital. When the water comes back on, many Puerto Ricans like Camacho keep the faucets running for hours, filling up cans, bowls and bins with water. Temperatures in Trujillo Alto hit 91 degrees Fahrenheit Monday. Camacho, a social activist, says the government has poorly maintained the local reservoir in his area, causing dirt to get in the reservoir, thus making the water undrinkable. "We have a big drought problem," says Camacho, 68. "We are saving water -- not just for drinking -- but for bathing and other fundamental things." This isn't Puerto Rico's first water shortage. In 1994, the island went through a similar water crisis. Puerto Ricans hoarded water then like they are now. Buckets of water sitting in a hot, tropical climate gave birth to mosquitoes, which sparked a Dengue fever outbreak. Maritza Stanchich remembers it well. She got Dengue fever in 1994. It was one of the worst experiences of her life. The government imposed water rations today make her concerned that another Dengue outbreak could ensue. A professor at the University of Puerto Rico, Stanchich isn't affected by the water rations since her San Juan neighborhood is a tourist hot spot. Still, she's helping out friends who get their water turned off. "I've offered showers to some of my friends in the area," says Stanchich. It's another major problem in a summer of sad news for Puerto Rico. Add on the default, an economy spiraling out of control and concerns about Congress lowering Medicare funding to the island, and it's easy to understand why Puerto Ricans are leaving in a mass exodus. "This is a perfect storm in the worst sense of the word," says Stanchich.